Coffeeshop Solo is close to Nieuwmarkt but a little bit “hidden”. At Nieuwmarkt, look for café Stevens and walk in that street. After about a few hundred meters you find this nice coffeeshop at a small beautiful canal. They braodcast Ajax when they play. Very local coffeeshop, my Dutch friend and his friends use this as their "local" and Ive visited here many times with all visits being excellent. The weed is average to good, hash is good to sometimes unbelievable. The local crowd that seemed to be there 90% of the time were also very down to earth and friendly, didnt make you feel like you stood out because you weren't Dutch. The staff again were very nice and friendly. 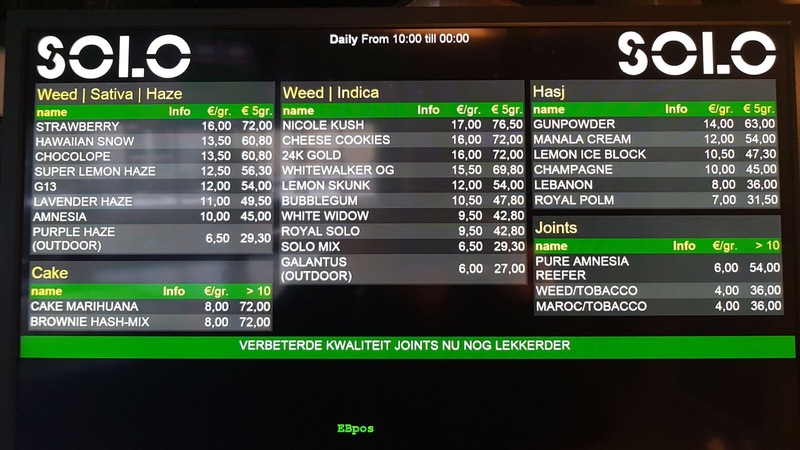 Weed and hash prices were very good for central Amsterdam. Few times I have been there they have showed the Ajax matches so thats always a reason to go if you're a football fan. Definitely recommend this place for smoke and to chill.